Kodak Christmas Ad 1968 This is a December 14, 1968 advertisement. It is a nice color ad from Kodak Camera. Shows a lady in a Santa Jacket and Hat and it reads, ""Merry Christmas and a Happy New Year from United Film Club."" 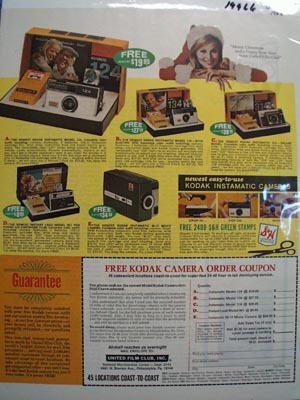 Also shows four different Kodak cameras. In excellent condition. Photo is taken through plastic and may show wrinkles or crookedness that is not in the ad. This magazine tear sheet measures 10 1/2"" wide by 13 1/2"" tall.